Students pull up a round of litterbags and root cores from the cereal rye-soybean plot. Photo Credit: Rusty Bailey, SIU College of Agricultural Sciences. A circle of life-and nitrogen-is playing out in farms across the United States. And researchers are trying to get the timing right. Some cover crops, such as hairy vetch or cereal rye, are not grown to be eaten. Instead, they capture nutrients, including nitrogen, from previous crops, the air, and the soil. When cover crops decompose, these nutrients are released. Cash crops, such as corn or soybean, planted afterward can use these nutrients to grow and thrive. But cash crops need different amounts of nutrients at different stages of growth. A new study assesses how quickly nutrients are released from two different cover crops. The goal, according to study co-author Rachel Cook, is to time nutrient release from cover crops to better match the nutrient needs of specific cash crops. "It's like trying to time a meal to come out of the oven exactly when all the hungry dinner guests arrive," says Cook, currently a researcher at North Carolina State University. The researchers focused on nitrogen because it "is typically the most limiting nutrient in crop production, but has the most potential for environmental impact from losses." The two cover crops, hairy vetch and cereal rye, are two of the most commonly planted cover crops in the Midwest. 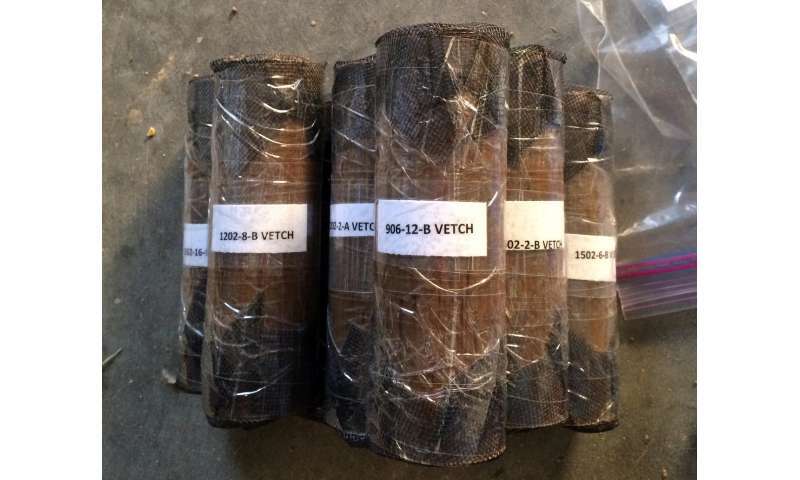 Soil cores with hairy vetch roots inside, ready to be buried in the field. After they are pulled back up, the soil will be washed off and the root biomass measured to look at rates of decomposition. Credit: Taylor Sievers. They found that hairy vetch and cereal rye had significantly different nitrogen release dynamics. "We now better understand the rate and quantity of nitrogen release from two of the more popular cover crops currently in use," says Cook. "This information can help farmers estimate how much nitrogen they might expect to get from their cover crop and when it will be available." The study showed that hairy vetch released more nitrogen overall compared to cereal rye. Nitrogen release was also quicker from hairy vetch plants whose growth had been halted. "Hairy vetch releases almost all available nitrogen in the first four weeks after it's terminated," says Cook. That's before the major time of nitrogen uptake by corn, which is around week eight after planting. "So, terminating hairy vetch too early could cause losses of nitrogen before the corn crop can get to it." Cereal rye, on the other hand, released nitrogen slowly over multiple weeks. "This would be beneficial before a cash crop with low nitrogen needs," says Cook. 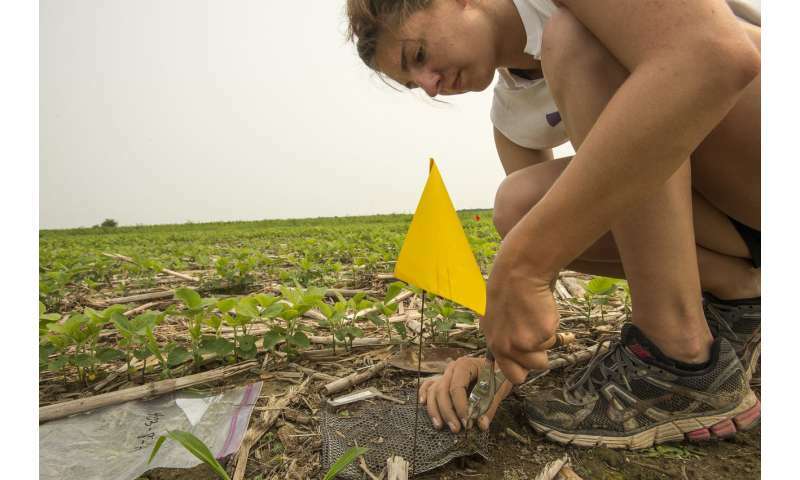 Taylor Sievers, now graduated masters student from Southern Illinois University Carbondale, pulls up a round of litterbags and root cores from the cereal rye-soybean plots for her decomposition experiment. Credit: Rusty Bailey, SIU College of Agricultural Sciences. The study was carried out in field test sites at the Agricultural Research Center at Carbondale, Illinois. Study plots were planted with either cereal rye or hairy vetch. 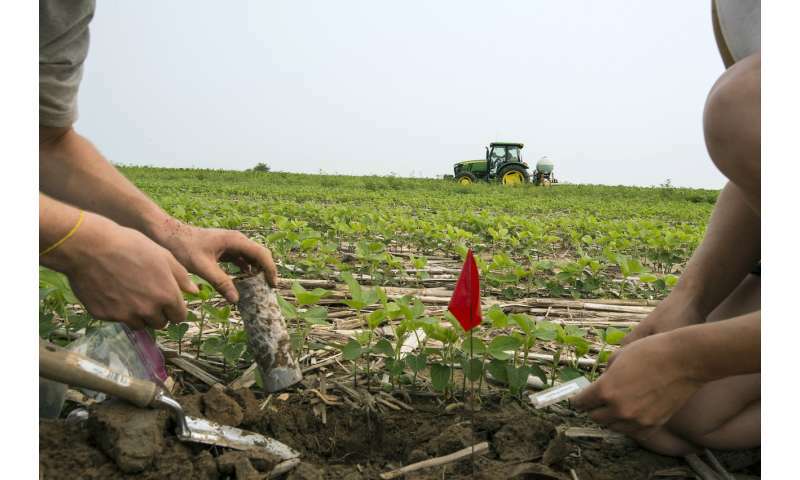 After terminating the cover crops with herbicide, researchers planted soybean or corn, respectively. The researchers measured the growth of the two cover crops, how quickly they decomposed once terminated, and the ensuing quantity and rate of nitrogen they released. Overall, hairy vetch plants released almost three times as much nitrogen compared to cereal rye plants. More than 70% of the total nitrogen released by hairy vetch occurred within the first two weeks after termination. In contrast, nitrogen release from cereal rye occurred later, with almost no net nitrogen release in the first four weeks after termination. Cook hopes that more information on how different cover crops release nutrients will help farmers make more informed decisions. "They will be able to choose which cover crop works best for their farm and the specific cash crops they are planting," she says. "They will also know when to terminate the cover crop prior to planting the cash crop." Cover crops also do more than release nutrients after they are terminated. They can help manage soil quality and erosion, for example. "Long-term studies with cover crops will be really important," says Cook. "These studies can help us understand how cover crops can improve soil properties over time and how that might improve cash crop yields."